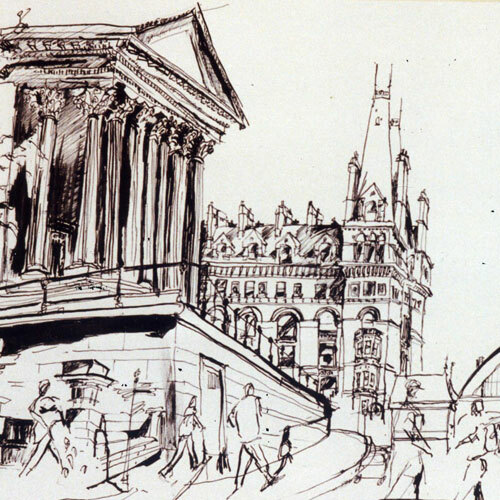 I went to Liverpool John Moores University to study Illustration between 1990-94. The course had a strong reportage focus, led by artist and illustrator Julia Midgley who organised really great drawing trips to Mounted Police and to the Ford Motor Factory at Speke. These experiences cemented the connection between my art and the world around me. Drawing with a dip pen and ink from observation became an important part of my process. I travelled to the Bahamas for the duration of my Summer in 1993 and it was here that the act of drawing became a ritual, giving my world structure and understanding through the process of visual communication. The colonial architecture and native people were so distinctly different. Through drawing I was able to give form to this extraordinary experience.